There are literally thousands of creative wedding invitation ideas. So we waded through them to bring you a small collection of creative designs that aren't just cute, they're also easy to make. To print your own, just download the template provided, add your wedding details and package it any way you like. Not sure exactly how to word them? 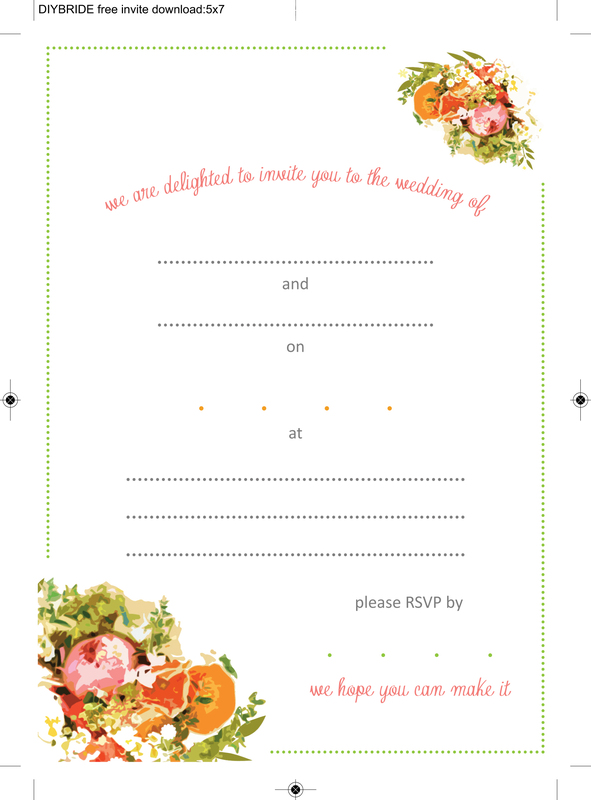 Use our invitation wording tool. 1. Download the Adobe Illustrator files attached here: Template 1 and Template 2. 2. To create the invitation: Open the invitation file and add your wedding information. (See suggested free fonts below.) Cut each sheet of white card stock into 2 sheets of 4.75" x 6.75" using the rotary paper trimmer. Print invitation file onto the cut sheets. 3. To create the details card: Open the details file and add your wedding information. Use a details card to direct guests to your wedding website, provide directions, maps, reception info or things to do in the area. Cut kraft card stock sheets into 4" x 5.5" and print onto the cut sheets. 4. Using the Fiskars Corner Punch: Romantique punch each corner of the invitation and details card. 5. Cut the kraft card stock into 5" x 7" sheets. Glue the kraft card stock into the invitation section of the pocket fold envelope. 6. Glue the invitations on top of the kraft cardstock using the repositionable glue stick. 7. Add the details card into the pocket on the right side and slide into the envelope. Invitation card stock: 5" x 7"
1. Download the template here. Open template in Adobe Reader. If you don't have it installed, download a free trial from Adobe.com. 2. Click on the blue box to activate the editable text area. 3. Click the 'CTRL' then 'E' keys on the keyboard ('Command' then 'E' on Mac). The "Form Field Text Properties" toolbar will pop up. 4. Change the fonts, text color, alignment with the toolbar - just like doing it in Word. 5. Print on 8.5" x 11" paper. 1. Download the invitation band template here. Open the template files in Microsoft Word. Type in your wording and print on 8.5" x 11" card stock. 2. Trim the invitation card along the dotted lines with a paper cutter. This will result in two 5" × 7" invitations. 3. Take the printed chevron band and score the fold lines. Take a ruler and X-acto knife, blade side up, to mark the fold lines. The fold lines are indicated on the printed template. This will ensure that your band fits snug with the invitation. 4. Trim the band along the dotted lines with a paper cutter. This will yield in two 3" x 10.5" chevrons bands. All cutting done! Time to start assembling. 5. Fold the band along the score lines and press the folds with your hands. 6. Use double sided tape to seal the band. The pieces will overlap to hide the tape and create a finished look. 7. Slip the band over the invitation and position so it's covering all of your event wording. Use an A7 envelope to mail this invitation to family and friends. RSVP card stock: 3.5" x 5"
1. Download the template here. Open template in Adobe Reader. If you don't have it installed, download for free from Adobe.com. White card stock: 8-½" x 11"
1. Download the invitation template here. 3. Print, trim and send. 2. Print the templates on 8.5" x 11" cardstock. 67lb paper works best, and white or cream would compliment the design nicely. 3. Using scissors or a paper cutter, trim along the dotted lines. The finished size of the invitation is 5" x 7″ and fits an A7 envelope. Both enclosure cards should be trimmed to 3.5" x 5″ and fit a 4-bar envelope. Tip: Be sure to hold the paper against the top edge of the paper cutter for straight cuts. 4. Optional: For a polished look mount the invitation to a gold pocket fold invitation and place the enclosure cards inside. Pocket folds cost approximately $1.25-2.00 each, but really give the package a high-end look. The pocket fold shown in the picture is from Marsupial Online. A less expensive option can be found at Paper and More. Tip: The best way to adhere the invitation to the pocket is with double sided tape. A glue stick will cause wrinkles.